If you’re like me, you’re all too familiar with the dreaded midday shine. You hop over to the restroom after lunch only to find that your complexion has a sheen to it that makes you look more sweaty than glowing. It’s the curse of oily skin, and if you’re looking to get rid of that shiny glare with a proper foundation, you’ve come to the right place. The best foundation for oily skin is one that absorbs excess oil, is light-weight (so you can skip the caked-on look) and of course, is oil-free. Having battled with acne-prone, oily skin for most of my life, I’ve come to realize that oil-free products are serious skin saviours. They really work to combat sheen and with the right ingredients, oil-free foundations will leave your face matte throughout the entire day – and some will even last into the night! Many provide coverage for up to 8 or 12 hours, but there are some miracle-working foundations that last up to 24 whole hours, which is great if you’re going to be on a long flight! Some foundations actually add to the shine of your skin, but while that may be preferable for some skin types, if you have oily skin, you want the exact opposite. You need a foundation that fights against oil, while still providing hydration and smooth coverage. Finding a foundation that is custom to your skin type can prove a tough task. That’s why I’m laying out the best foundation for oily skin that will improve the look of your complexion each and every day. L’Oreal’s matte foundation is formulated with Shine Defying Blotting Spheres. They work like blotting papers to absorb sweat and oil; how amazing it that! And Maybelline’s foundation not only combats oil, but also minimizes the look of pores. Revlon’s formula includes SoftFlex technology so that you don’t have to worry about it rubbing off during the day, and Clinique’s liquid makeup works to treat and prevent breakouts that are typical of oily skin. With your busy on-the-go days and nights, it’s important to find a foundation that provides long-lasting matte coverage for your oily skin. Finding your true match foundation will ensure you’re not worrying about how your skin looks midday or after work. You can focus on other more important things. 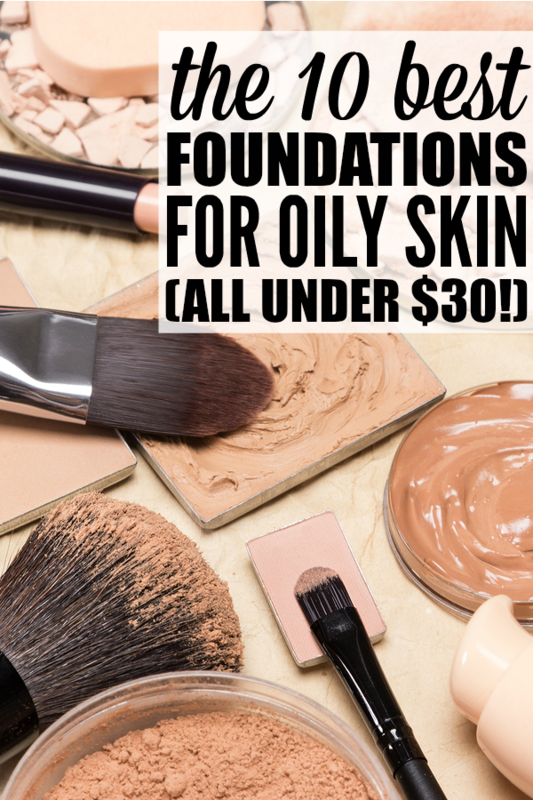 From Rituals Matte Finish Foundation that absorbs oil and allows your skin to breathe, to No7’s hypo-allergenic formula, these are the ten best foundations for oily skin (and they’re all under $30!). This foundation has an “air-light” texture, which is so important for me. It’s essential that my foundation doesn’t cake on, and looks as natural as can be. This foundation is strongly pigmented to smooth out your complexion and allow it to shine without looking oily. It’s made with Shine Defy Blotting Spheres that absorb sweat and oil so that your face will stay matte throughout the day. I am a Clinique devotee. I love their products, especially for my oily, acne-prone skin. This liquid foundation is oil-free and light weight and will go on smoothly, keeping your skin nice and matte throughout the day. It also works to treat and prevent breakouts. Maybelline’s dermatologist-tested formula is great for minimizing pores (without clogging them) and absorbing oil for a natural matte finish. It’s infused with micro-powders that diminish the look of pores and conceal imperfections. Circa’s liquid foundation provides hydration to your skin and blends seamlessly with your complexion. It also provides medium to full coverage and comes in a range of colours to match your skin tone. It enhances your complexion rather than trying to hide it up, which is key for a natural look. This foundation formula is a dream if you have oily skin. It’s absorbed flawlessly by the skin, allowing it to breathe throughout the day. It’s also infused with pure stones so that your complexion will have delicate and natural matte sheen. An extra bonus comes in the form of SPF 15, since sunscreen is an important everyday necessity. This foundation was formulated with oily skin in mind. It’s hypo-allergenic and includes SPF 15 for sun protection. It goes on evenly for a sheen-free look that lasts up to 12 hours, so you won’t have to worry about your midday shine. The name says it all for this one. The formula helps control shine and it’s lightweight so it won’t feel heavy or greasy on your skin. You can wear it all day for a natural look that will have your face looking completely matte! Made with Micro Clear Technology that breaks through oil and unclogs pores, this oil-free foundation is perfect if you have oily skin! It also works to prevent new breakouts and treat pesky blemishes. It goes on and stays on matte to keep you shine-free throughout the day. This loose mineral foundation minimizes the look of pores and absorbs the skin’s excess oil for a naturally matte look. It will give you great coverage for up to eight hours and won’t dry out your skin. Get that no-makeup look with this light-weight foundation. Made with SoftFlex technology, it won’t rub off throughout the day, and the oil-free formula gets any excess oil from your skin under control! You’ll look fresh, natural, and shine free! If you’re in the market for a foundation that will combat your oily skin, try one of these out for size. One that’s oil-free, light-weight, and pore-minimizing will ensure your skin looks its best whether you’re stuck at the office, on a long flight, or out for a night dancing with your friends! If you found our recommendations on the best foundation for oily skin, please share them on Pinterest! And if you’re looking for more beauty-related tips and tricks, please follow our Beauty board where we stay on top of all of the latest trends!